E.T. 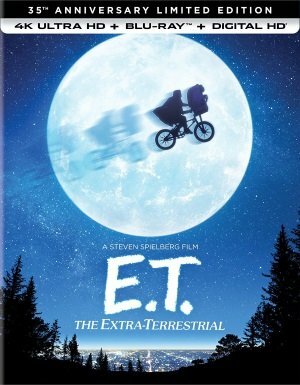 The Extra-Terrestrial (1982), Steven Spielberg’s suburban fairy tale for kids who think they are too hip to believe in fairies, turns 35 with a new E.T. The Extra-Terrestrial 35th Anniversary Limited Edition (Universal) plus additional Blu-ray, DVD, and 4K Ultra HD editions. Henry Thomas is Elliot, an emotionally bruised kid suffering under his parents’ separation who finds and bonds with another lonely, lost soul, a benevolent alien left behind when his spaceship leaves. “I’m keeping him,” says Elliot, but meanwhile an army of government men search for him. As E.T. grows homesick and just plain sick. Elliot and friends need to help get E.T. home. It’s a fantastical adventure with a grounding in the modern suburbia of divorce and adolescent anxiety, and E.T. is the ultimate imaginary playmate come to life. Part pet, part best friend, part guardian angel with an emotionally symbiotic connection to Elliot, this funny looking stranger in a strange land (think of a squat, mutant teddy bear with lizard skin and monkey fingers and voice between a growl and a purr) is a wizened old grandfatherly being with the trust and playfulness of a child.